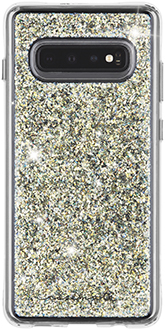 Iridescent glitter foil gives your phone a glamorous look that sparkles. The sturdy one-piece design protects your phone from drops of up to 10 feet. The case has a smooth finish that prevents scratches. Metallic chrome buttons add refined finishing details for a complete, polished look.